this option enabled by default on android. It will be useful for html5 games. I test few games with google-chrome with accelerated_2d_canvas enabled, they works fine. Chris, this is games using the <canvas> tag and drawing on this surface. Is there a either a way to enable that accelerated 2d canvas feature? Or alternatively, is thee another rendering path to use to benefit from HW acceleration built into Oxide? The issue here is that accelerated canvas is currently blacklisted on Chrome Linux because of driver bugs. In order to enable it safely at runtime on specific hardware, we need to implement support for gathering GPU info to feed in to the GPUDataManager, and then we need to modify the GPU blacklist to enable it. no, It does not work properly with oxide. I did special build with enabled acceleration, but canvas wasn't rendered properly. How did you test this works on Chrome? After talking with Chris, AIUI, this is disabled for all Chromium on linux because it doesn't work. This will need someone familiar with the Chromium graphics stack to fix. it's unstable, but it works (depend on driver). Yes, it's disabled because it's unstable across a wide range of drivers. Did you test that it works in Chrome for Android on the same hardware you also verified that the canvas doesn't render correctly with Oxide? Maxim, on what platform are you testing this? Desktop, Touch, Android, something else? There are other features that are also disabled. So this is an upstream chromium api issue. I think we would need an expert in this area to address this fully. From 'c', this is actually quite tricky because upstream has determined this is too buggy to implement everywhere themselves, and we don't have all the hardware out there. Also, 'e' is not particularly difficult and would take time. Presumably, 'Linux' in upstream's mind means Linux drivers. However, if the devices are using android drivers, then perhaps when implementing 'e' we can determine if we are running a linux driver. We can then add a special entry to the gpu database for disabling the accelerated 2d canvas. Then if we detect if we are running a linux driver, we use this blacklisted entry. We still need the mechanism in 'e' to get the information on the android drivers to feed into the database. By doing this, we maintain upstream's position of not enabling the accelerate 2d canvas, but it will be enabled with android drivers that are known to work (based on upstream's own database). >it's disabled because it's unstable across a wide range of drivers. > Did you test that it works in Chrome for Android on the same hardware you also verified that the canvas doesn't render correctly with Oxide? 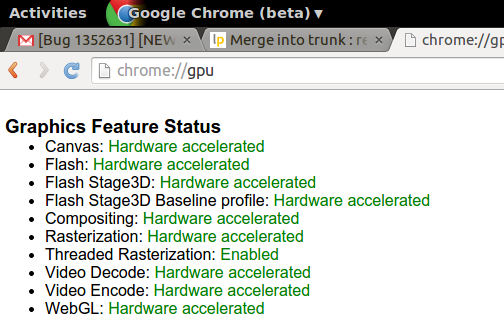 game works fine with enabled 2d_acceleration on chrome(desktop) & android(nexus 4). rendering problems appear on oxide(desktop). I did not test it on device with oxide. It can be an option (disabled by default). so can we enable this for android-drivers based devices? > so can we enable this for android-drivers based devices? Ok, we seem to not be communicating well. The Oxide team needs to understand what has been tested in clear terms in order to know if we can proceed with enabling this when using Android drivers at all. 1. does <URL> work on Chrome for Android on krillin? 2. does <URL> work on Chrome for Android on mako? 3. does <URL> work on Chrome for Android on flo? 4. does <URL> work on Chrome for Android on manta? 5. [OPTIONAL] does <URL> work on Chrome for Android on hammerhead? 1. does <URL> work on Oxide for Ubuntu Touch on krillin? 2. does <URL> work on Oxide for Ubuntu Touch on mako? 3. does <URL> work on Oxide for Ubuntu Touch on flo? 4. does <URL> work on Oxide for Ubuntu Touch on manta? 5. [OPTIONAL] does <URL> work on Oxide for Ubuntu Touch on hammerhead? When the above is done and it is demonstrated that our target hardware works with '2d canvas enabled' on Oxide for Ubuntu Touch, we can understand the scope of the work and get it assigned to someone. I don't have this devices. as I mention before, speed up is more then _300_% (upto 1000 %). > Have you tested Oxide specifically with '2d canvas enabled'? I will summarize the report at this stage. 1. We want accelerated canvas_2d support, because alternatives won't help. Existing applications use it, few use the old SVG support. And we expect that this feature will let us get more of those HTML5 games. a/ If we enable accelerated_2d_canvas in Oxide for armhf on N4: is the rendering correct? or broken like on the desktop? b/ If we enable accelerated_2d_canvas in Oxide for armhf on N4: how is the performance? c/ does the above apply to other models like krillin? Maxim is building Oxide (current) with the flag enabled and will test on armhf/mako to check a/ above at least, and /b to the extent applicable. David Barth's team is driving this bug now, and we spoke and thought this is a 2014-09-25 target, so marking the bug as such. something changed in chrome codebase. i am getting 60 fps with new oxide & chrome (with disabled 2d_acceleration). same 10 fps on the device. cross-compilation instructions sent by Chris. > something changed in chrome codebase. > same 10 fps on the device. By forcing the use of the accelerated 2d canvas (via settings->setAccerlerated2dfCanvasEnabled(true); in render_view_impl.cc), I've had positive results; with frame rates over 40, maybe 50 average. This is on a Nexus 4. Further testing by Chris indicates that Krillin can also support the same accelerated 2d canvas feature. A build is now available in https://launchpad.net/~phablet-team/+archive/ubuntu/ppa/ for people interested in testing. On N4, I can get a solid 40FPS most of the time, with up to 57FPS at times.